This photo was taken on January 22, 2017 at 9:47 AM. The location was in the sidewalk in the City Center district in Washington DC. The "Take It!" was one without hesitation. The stillness of the water that had collected on the surface of this manhole cover and the reflection that was brought about was simply magical to me. The After Take: This was one of those pictures that kept on showing itself to me in my memory. Such a lucky take and delightfully uncomplicated. Here is hoping you find in a next step, something similar that will stop you in your tracks for a moment of wonder. Its like looking into a portal, crystal clear image. For some reason Jim kept saying it was like a portal. I'm not sure why his mind went to portal instead of a mirror, which is what I though. Either way this was a great find! Wow its so pretty almost a perfect circle. Thats the kind of puddle we would see and just have to jump into as kids. Beautiful photograph. Can you imagine how stunning it would be if the trees had leaves? I've been trying a new approach when I look at your pictures. I don't read the title or your words until after I look at the picture. When I look at the picture I say the first thing that comes to mind. With this one I thought, that looks like a broken mirror. 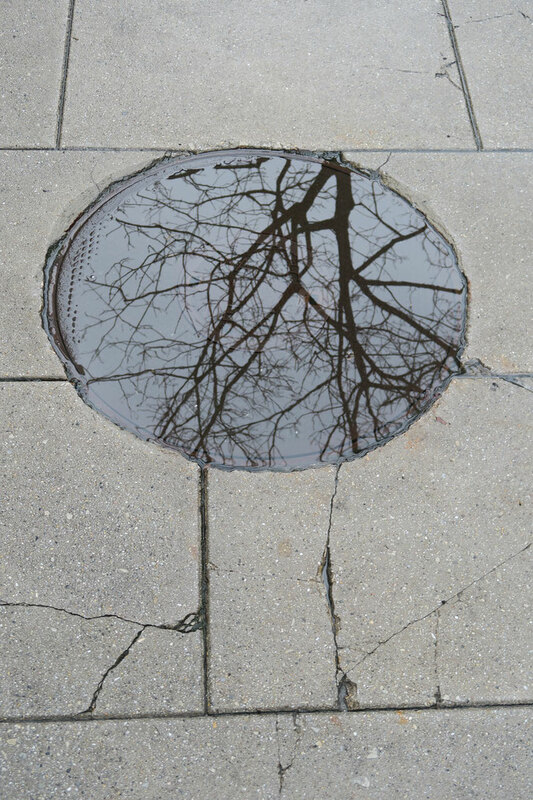 I think its really cool how some of the cracks in the concrete line up with the branches in the reflection. Was that intentional or just a happy bonus? I really like this picture. The calmness of the water, on a city sidewalk, almost unheard of.